Patrice DÃ©silets is officially back at the company he left in 2010 thanks to Ubisoft's acquisition of THQ's Montreal studio. Almost three years ago, acclaimed game developer Patrice DÃ©silets left Ubisoft after more than ten years with the company. He was one of the driving forces of the Assassin's Creed series, and was serving as Assassin's Creed: Brotherhood's creative director at the time of his departure. Little explanation was given for DÃ©silets' sudden split, and he ended up at THQ Montreal a few months later. Fast forward to January 2013, when that studio was purchased by Ubisoft as part of THQ's going out of business sale. So where does that leave DÃ©silets? Back at the publisher he left in 2010, apparently; Ubisoft has confirmed that the Assassin's Creed creative director is officially back. According to a spokesperson, Ubisoft is "very pleased to welcome Patrice to Ubisoft again," and the publisher believes "that this renewed partnership will produce new ideas and high-quality titles for Ubisoft's customers." The statement didn't mention what games DÃ©silets will be working on now that he's officially part of the Ubisoft family again, but THQ Montreal's games in development were scooped up in the sale, so presumably he will continue working on them. Considering that THQ got in legal trouble for poaching DÃ©silets from Ubisoft, his departure probably wasn't the smoothest of transitions. Perhaps that's why it took Ubisoft two months to confirm that he was back with the company, which essentially means he didn't quit his job at the former THQ Montreal studio. 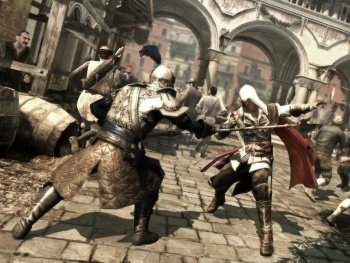 As recently as last summer, he noted that he wasn't a huge fan of recent Assassin's Creed games, but it remains to be seen whether he'll end up working on the series again.